1. Melt the butter in a large pan and cook the onion for 5 minutes over a medium heat until soft but not browned. 2. Stir in the spices and cook for 30 seconds. Add the cabbage, apple, vinegar, sugar and apple juice. Season. Stir to mix thoroughly then cover tightly and simmer gently for 1½ hours, stirring occasionally, until very tender. Add a little extra water or apple juice if the cabbage gets too dry and starts to stick. 3. Stir in the cranberry sauce, stem ginger and its syrup. Season and serve. 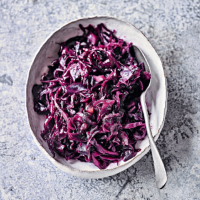 Cook’s tip Get ahead: this red cabbage tastes even better made up to 48 hours in advance. After cooking, cool, then cover and chill. Reheat thoroughly before serving.